Here, we present a protocol to coculture primary cells, tissue models and punch biopsies in a microfluidic multi-organ chip for up to 28 days. 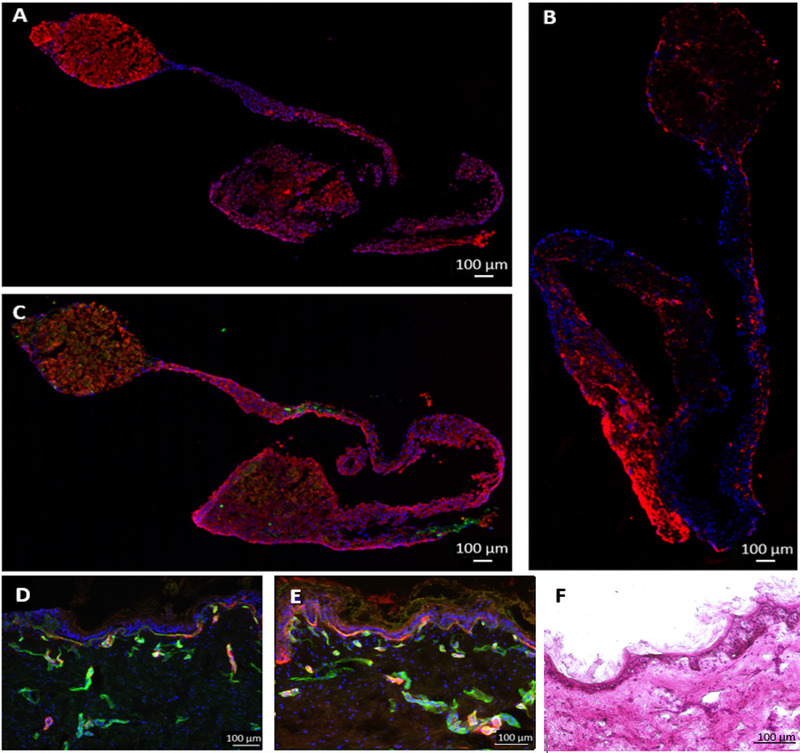 Human dermal microvascular endothelial cells, liver aggregates and skin biopsies were successfully combined in a common media circulation. Materne, E. M., Maschmeyer, I., Lorenz, A. K., Horland, R., Schimek, K. M., Busek, M., Sonntag, F., Lauster, R., Marx, U. The Multi-organ Chip - A Microfluidic Platform for Long-term Multi-tissue Coculture. J. Vis. Exp. (98), e52526, doi:10.3791/52526 (2015). The ever growing amount of new substances released onto the market and the limited predictability of current in vitro test systems has led to a high need for new solutions for substance testing. Many drugs that have been removed from the market due to drug-induced liver injury released their toxic potential only after several doses of chronic testing in humans. However, a controlled microenvironment is pivotal for long-term multiple dosing experiments, as even minor alterations in extracellular conditions may greatly influence the cell physiology. We focused within our research program on the generation of a microengineered bioreactor, which can be dynamically perfused by an on-chip pump and combines at least two culture spaces for multi-organ applications. This circulatory system mimics the in vivo conditions of primary cell cultures better and assures a steadier, more quantifiable extracellular relay of signals to the cells. For demonstration purposes, human liver equivalents, generated by aggregating differentiated HepaRG cells with human hepatic stellate cells in hanging drop plates, were cocultured with human skin punch biopsies for up to 28 days inside the microbioreactor. The use of cell culture inserts enables the skin to be cultured at an air-liquid interface, allowing topical substance exposure. The microbioreactor system is capable of supporting these cocultures at near physiologic fluid flow and volume-to-liquid ratios, ensuring stable and organotypic culture conditions. The possibility of long-term cultures enables the repeated exposure to substances. Furthermore, a vascularization of the microfluidic channel circuit using human dermal microvascular endothelial cells yields a physiologically more relevant vascular model. Current monolayer or suspension cell culture assays for drug development are failing to emulate the human cellular microenvironment and, therefore, lead to a rapid dedifferentiation and loss of function in primary human cell cultures. Tissue models with higher physiological relevance are needed to predict the efficacy and safety of compounds before admitting them to clinical trials. Recently, standard in vitro cell culture techniques have evolved from two-dimensional monolayer cultures toward three-dimensional multi-cellular models, aiming to mimic the in vivo tissue microenvironment. These systems have already shown major improvements towards more accurate prediction of the mode of action of compounds 1,2. Furthermore, adapting the in vitro culture conditions to the highly specialized needs of cells is of particular interest. Under standard in vitro conditions, a variety of important culture parameters, such as nutrient and oxygen supply, removal of accumulating products, and mechanical force acting on the cells often cannot be controlled thoroughly in most cases. Many organs possess physiologically relevant concentration gradients of substances and dissolved oxygen. However, those highly regulated and optimized conditions are in clear opposition to the uncontrollable diffusion gradients around tissues under in vitro conditions, leading to a highly unstable environment and limiting cellular development 3. Thus, steadier and especially more quantifiable in vitro conditions are required to keep cells viable and differentiated over prolonged periods of time. Perfused systems, where medium components are regularly removed and substituted, are often better characterized and controllable than static cultures concerning the direct surrounding of tissues. Under static conditions, diffusion gradients of cell secretions and culture medium nutrients might surround cultured cells 3. Introducing well-characterized medium flow rates around the tissues allow the cell secretions to mix with the rich medium through perfusion. This enables the generation of defined cellular microenvironments, ensuring a stable cellular phenotype and metabolizing enzyme expression throughout the whole assay duration 4. Recent developments in multi-organ chip (MOC)-based systems combine the benefits of a controlled medium flow around engineered tissues with the small medium and cell mass requirements of microscale bioreactors, leading to a reduced amount of substance needed during testing. Several microfluidic systems for tissue culture have been described so far 5,6. Tissue-to-fluid ratios within these systems play an especially crucial role in simulating physiologically relevant cellular crosstalk. However, due to technical limitations, such as the use of external pumps and media reservoirs, the overall circulating media volume in most systems is too large compared to the tissue volumes. The group of Shuler et al. were the first to develop a system ensuring proper residence times of substances within the cell culture compartments and in vivo relevant tissue-to-fluid ratios 7,8. This was achieved by scaling the external reservoir down to a 96-well plate, also representing the “other tissues” compartment. In order to minimize the circulating media volume within our MOC platform, we integrated a peristaltic on-chip micropump, eliminating the need for external media circuits. This micropump is able to operate the system at a selectable number of media flow velocities and shear stress rates 9. A microfluidic channel system of 500 µm width and 100 µm height interconnects two standardized tissue culture spaces, each having the size of a single well of a 96-well plate. Adhering to the sizes of industry standard well plates allows the integration of already existing tissue models produced in the transwell format. Furthermore, the vertical position of transwell cell culture inserts is adjustable, enabling the cultivation of tissue models which are not only directly exposed to the fluid flow, but can also be lifted up and shielded from the underlying current. Similarly, air-liquid interface cultures are feasible using this system. The MOC platform is fabricated from a polydimethylsiloxane (PDMS) layer 2 mm high and a glass microscope slide with a footprint of 75 x 25 mm2, which are permanently bonded by low pressure plasma oxidation to form the fluid-tight microfluidic circuit. The PDMS layer containing the respective channels and cell culture compartments is produced by standard soft lithography and replica molding 9. The microfluidic design of the MOC used during this study consisted of two separate microfluidic circuits per chip, each holding two cell culture compartments interconnected by a channel system 100 µm high. This allowed the performance of two individual two-tissue cocultures using one multi-organ chip. Pumping frequencies were adjusted to yield medium flow rates of 40 µl/min. This two-tissue MOC design provided the capability to coculture a liver spheroid and a skin punch biopsy in separate culture spaces, albeit in a combined media circuit under physiological flow conditions. Differentiated HepaRG cells were aggregated together with human hepatic stellate cells (HHSteC) at a ratio of 24:1 to form homogenous spheroids. This ratio was found to be optimal, as observed in previous experiments 10, even though, nearly twice the number of hepatocytes were used compared to the in vivo situation. The skin was cultivated at an air-liquid interface inside a transwell cell culture insert, thus enabling topical substance exposure. These tissue models were cocultivated for 28 days in the MOC to demonstrate the comprehensiveness of this system. Furthermore, the microfluidic channel circuit of the chips was fully covered with human dermal microvascular endothelial cells (HDMEC) to more closely simulate the vascular system. NOTE: Human juvenile prepuce was obtained with informed consent and ethics approval (Ethic Committee Charité University Medicine, Berlin, Germany), in compliance with the relevant laws, from a pediatric surgery after routine circumcisions. Aggregate HepaRG and HHSteC in hanging drop plates to generate liver spheroids. In order to achieve the trypsinization of HepaRG cells grown in cell culture flasks (75 cm2), remove the medium from confluent, differentiated monolayer cultures, wash with PBS twice, and add 3 ml of 0.05% Trypsin/EDTA. Incubate for 3 to 5 min at 37 °C and stop the reaction by adding 6 ml of trypsin inhibitor. Centrifuge HepaRG cells at 150 x g for 5 min, remove supernatant, resuspend the cell pellet in 1 ml of HepaRG cell culture medium, and count cells. Cell viability should be >90%. In order to achieve the trypsinization of HHSteC cells, remove the medium from monolayer cultures, wash with PBS twice, and add 3 ml of 0.05% Trypsin/EDTA. Incubate for 5 min at 37 °C and stop the reaction by adding 6 ml of trypsin inhibitor. Centrifuge the HHSteC cells at 150 x g for 5 min, remove supernatant, resuspend the cell pellet in 1 ml of HepaRG cell culture medium, and count cells. Combine HepaRG and HHSteC at a ratio of 24:1 in HepaRG cell culture medium. To do so, adjust cell numbers by diluting cell suspensions in HepaRG cell culture medium and add 1 x 105 cells/ml HHSteC to 4.8 x 106 cells/ml HepaRG cells. Mix carefully. Prepare a hanging drop plate by adding 2 ml of PBS to the hanging drop and receiver plate. Pipette 20 µl of the cell suspension into each well of the hanging drop plate. Always prepare about 10% more hanging drops than you need to retrieve aggregates, as some aggregates are lost during the procedure. Carefully place the plate in a 37 °C incubator. Wait 48 hr for the spheroids to form. In order to retrieve the spheroids, be sure to use pipette tips with wide tip endings or cut the tips of 1 ml pipette tips with a sterile knife in order to widen the opening to about 2 to 3 mm. Use these pipette tips to handle the spheroids without disrupting them. Wash off spheroids carefully from the hanging drop plate by repeatedly adding 1 ml of media to the top of the wells of the hanging drop plate using a pipette. Wash the plate until all the spheroids have fallen off. Spheroids are slightly disc-shaped with a medium diameter of 300 to 400 µm and a height of 200 to 300 µm at this point. Collect the spheroids in the receiver plate and transfer them to 24-well ultra-low attachment plates with a maximum of 20 spheroids per well using the prepared pipette tips. Adjust the media volumes in each well to 0.5 ml. Use 20 aggregates to inoculate one MOC circuit to obtain a miniaturization rate of 1/100,000 regarding in vivo cell numbers. Incubate the spheroids at 37 °C and 5% CO2 until further use in the MOC. Do not store the spheroids longer than three days before usage to assure comparability. Cultivate the aggregates for at least one day in ultra-low attachment plates to retrieve the homogenous spheroids. Pursue either of two approaches to generate skin tissue equivalents: the use of punch biopsies (1.2.1) or the use of ready-made in vitro tissue models (1.3.1). Cut transwells with an incandescent knife below the bracket to prepare 96-well cell culture inserts and store under sterile conditions until further use. Sterilize prepuce samples in 80% ethanol for 30 sec and cut the ring open. Samples should have an average height of 2 mm. Use a biopsy punch to cut biopsies of 4.5 mm diameter to obtain an equal miniaturization ratio for both liver and skin. Load the biopsies into the prepared 96-well transwell inserts with forceps. Take care to position the biopsies with the epidermal side facing upwards. Place cell culture inserts with biopsies in a receiver plate containing HepaRG cell culture medium and store at 37 °C and 5% CO2 until further use in the MOC. Do not store samples longer than 2 to 3 hr. Integrate ready-made in vitro skin models, purchased from various suppliers, into the MOC, making sure that they are in 96-well transwell format. Use the cell culture medium supplied by the vendor or, if a coculture with another tissue is envisaged in a further step, use a minimal medium supporting both tissues. Test the respective minimal medium in prior static experiments for its capacity to support the tissues. Retrieve skin models from the holder plate and cut the 96-well inserts below the bracket with an incandescent knife. Place the inserts back into the receiver plate and store at 37 °C and 5% CO2 until further use in the MOC. Do not store samples longer than one day. Mix the PDMS and curing agent at a ratio of 10:1 (v/v) and place the mixture under vacuum for 15 min to remove air bubbles. Meanwhile, treat a polycarbonate cover-plate with the silicon rubber additive at 80 °C for 20 min. Insert Teflon screws into respective holes of the cover-plate to create the four PDMS-free cell culture compartments and the six PDMS membranes, 500 µm thick, of the micropump. Plug the prepared cover-plate to the master mold of the two microvascular circuits and inject the degassed PDMS. Take care not to integrate air bubbles into the system. If bubbles emerge, try to remove them by tilting the device. Incubate the system at 80 °C for 60 min to cure the PDMS layer. Remove the master mold and the Teflon screws from the device and bond the PDMS layer to a glass slide with a 75 x 25 mm2 footprint using low pressure plasma oxidation. Screw special thread MOC adapters to all four cell culture compartments of the cover-plate. Connect syringes containing culture medium to female Luer x ¼-28 male adapters and screw them to the MOC adapters of the cover-plate. Inject the medium into the microfluidic circuit by repeatedly pushing down and pulling up the syringes plungers. Check the proper filling of the channels with medium under the microscope. Prior to endothelializing the MOC, flush each MOC circuit with endothelial cell growth medium and incubate it statically for three days at 37 °C and 5% CO2. Sterilize the MOCs using an ethanol wipe and place them under a laminar flow bench. In addition, sterilize two pairs of forceps and two hexagonal keys for further use. Loosen the caps of the tissue culture compartment of the MOC using the hexagonal keys and remove the caps using the forceps. After inserting the medium, screw caps back on to the MOCs in the same way. In order to achieve the trypsinization of human dermal microvascular endothelial cells (HDMEC), remove the medium from the monolayer cultures, wash with PBS twice, and add 3 ml of 0.05% Trypsin/EDTA. Incubate for 5 min at 37 °C and stop the reaction by adding 6 ml of trypsin inhibitor. Centrifuge the HDMEC at 220 x g for 5 min, remove supernatant, resuspend the cell pellet in 1 ml of endothelial cell growth medium, and count cells. Cell viability should be >90%. Adjust the cell count in the cell suspension to a final concentration of 2 x 107 cells/ml by diluting it with endothelial cell growth medium and transfer 250 µl of it to a 1 ml syringe. Apply this concentration of cells to the MOC to keep the miniaturization rate of 1/100,000 for all organs. Connect the syringe to a female Luer x ¼-28 male adapter, expel the air out of this fitting, and screw it to a special thread MOC adapter. Connect the adapter to one of the two compartments of each MOC circuit. Connect an empty syringe in the same way to the second compartment of the MOC circuit. Inject the cells evenly by pushing down and pulling up the two syringe plungers several times in a consecutive way. Control the infusion of cells under the microscope. Incubate the MOC at 37 °C and 5% CO2 under static conditions for 3 hr to allow the cells to adhere to the channel walls. Remove the chip from the incubator, place it under a laminar flow bench, and replace the syringes and the MOC adapters with special thread MOC cell culture chambers. Add 400 µl of fresh medium to one compartment of each MOC circuit and let it flush through the channels by hydrostatic pressure. Afterwards, replace the medium in both compartments with 300 µl of fresh medium. Close the compartments using caps, as described in 3.1.2. Connect the chip to the pump control unit. Adjust the pumping velocity to a frequency of 0.475 Hz and cultivate the chip at 37 °C and 5% CO2. Replace the medium of each MOC compartment every one to two days and monitor the cell morphology by light microscopy. Place the MOC under the laminar flow bench and open it, as described in step 3.1.2. Remove the media from the tissue culture compartments and replace it with 300 µl of fresh HepaRG cell culture medium. Transfer 20 preformed spheroids to one tissue culture compartment of each MOC circuit using the pipette tips with a wide opening (see steps 1.1.8/9). Close the cap using forceps and hexagonal keys. Transfer 96-well cell culture inserts containing skin equivalents to the remaining tissue culture compartment of each MOC circuit using forceps. Take care to avoid bubble formation below the membrane of the skin equivalent. In order to do this, insert transwells at a slightly tilted angle and push down gently. Remove excess medium around the transwell being pushed up from below with a pipette. Close the cap using forceps and hexagonal keys. Set operational parameters in the control units to the values desired. Modify air pressure from 0 to 8,000 mbar, vacuum from 0 to -800 mbar, and pumping frequency from 0.24 to 2.4 Hz. Set the pumping direction clockwise or counterclockwise. Remove the MOC containing tissue equivalents from under the laminar flow bench and connect it to the pump control units. Following the numeration on the tubes, insert air pressure tubing to the respective fittings on the MOC. Cultivate the MOC at 37 °C and 5% CO2 in an incubator or, in the case of live tissue imaging, use the MOC support to heat the chip to 37 °C and cultivate the chip outside the incubator. Use the heated support to cultivate cells in the MOC under a standard microscope. Perform routine media exchange every day or every other day, considering the type of tissue cultured and the metabolic activity of the cells. Retrieve the MOC from the incubator and observe it under the microscope to control media flow rates and check for contamination. Disconnect the MOC from the pump control unit by unplugging the air pressure tubing. Sterilize the MOC using ethanol wipes and put it under the laminar flow bench. Open the tissue culture compartment containing the liver spheroids, as described in step 3.1.2. Remove up to 200 µl from the compartment using a pipette without disrupting the spheroids and store the medium in an empty well of a deep-well plate. Analyze the media sample directly or close the deep-well plate and store the media samples at -80 °C for further analysis. Replace the medium of the MOC with up to 250 µl fresh cell culture medium and close the cap. The difference in the amount of medium removed and replaced accounts for the loss due to small amounts leaking out of the chip when closing the system. Open the cap of the tissue culture compartment holding the skin equivalents at this point to check for tissue intactness. Take care not to introduce air bubbles into the system. Close the cap. Connect the tubing of the pump control unit to the MOC, according to step 5.3, and place the MOC in an incubator. Analyze tissue culture performance on-line using live cell imaging or offline, by analyzing the daily media samples. Perform the latter by standard routine enzymatic assays (e.g. lactate dehydrogenase (LDH) activity) or ELISA (e.g. albumin concentration). An online analysis is described in the following. Remove the media of the endothelialized MOC, as described in steps 6.1.1 to 6.1.4, and replace it in both tissue culture compartments with 200 µl of 10 µg/ml fluorophore conjugated acetylated low-density lipoprotein (LDL) solution (diluted in cell culture media). Close the caps. Connect the MOC to the pump control unit, according to step 5.3, and pump it for 30 min at 0.475 Hz to distribute the solution evenly within the microfluidic circuit. Stop the pumping and incubate the MOC statically for 3.5 hr at 37 °C and 5% CO2. Similar to step 7.2, remove the acetylated LDL solution from both compartments and replace it with 400 µl of fresh medium in one of the two compartments. Wait for 3 to 5 min to let the hydrostatic pressure drive the medium through the microfluidic channel circuit. Replace the medium which has flowed through with 300 µl of fresh medium and also fill the second tissue culture compartment with 300 µl of fresh medium. Close the MOC, according to step 3.1.2. Put it under a fluorescence microscope and observe cell growth and viability. Place the stained MOC back in the incubator to continue cultivation. Remove the stain leaking out of the cells with each following media replacement. Retrieve tissue equivalents from the MOC at the end of the experiment for endpoint analyses. In order to retrieve the liver and skin equivalents from the MOC, remove the media from each tissue culture compartment, as described in steps 6.1.1 to 6.1.4. Remove the 96-well cell culture inserts containing the skin from the MOC using forceps. Peel off the membrane carefully from the insert by gripping it on one side with forceps and pulling it down. Take care not to lose the skin equivalent at this point. Freeze the membrane holding the skin equivalent in cryo-embedding compound and store it at -80 °C until further analysis. Remove the liver equivalents similarly from the tissue culture compartment by pipetting them using cut pipette tips (see step 1.1.8/9). Embed the liver spheroids in cryo-embedding compound. Take care not to transfer too much liquid and remove any excess fluid with a pipette. After placing the spheroids onto the embedding compound and removing the medium, add further cryo compound onto the top of the spheroids to fully enclose them. Freeze the liver equivalents and store it at -80 °C until further analysis. Perform endpoint analysis by cutting the tissue equivalents in a cryo-microtome to 8 µm sections and staining for tissue-specific markers, as described in previous protocols 10. Standard in vitro tissue cultures are performed under static conditions, limiting the diffusion of the oxygen and nutrient supply to the tissues. Fluidic systems, showing improved supply characteristics, are often hampered by their large medium requirements, having non-physiologically high medium to tissue ratios. Thus, metabolites are diluted and cells are not able to condition their surroundings. The MOC presented in this study connects two separate tissue culture compartments, each the size of a single well of a standard 96-well plate, by a microfluidic channel system. The small scale of the system and the integration of the pump on the chip allows the system to operate at media volumes of only 200 to 800 µl. This corresponds to a total systemic medium to tissue ratio of 8:1 to 31:1, respectively, for the liver and skin tissue cocultures (having a total tissue volume of about 26 µl). The total extra-cellular fluid volume in a man weighing 73 kg is 14.6 L, whereof the intercapillary fluid volume is 5.1 L, leading to a physiological extracellular fluid to tissue ratio of 1:4. Therefore, the amount of media in the whole circulation system in the MOC is still larger compared to the physiological situation; and yet, it represents the smallest media to tissue ratio reported so far for multi-organ systems 5. As industry standard tissue culture formats are retained, researchers are able to combine existing and already validated static tissue models within a common fluid flow. Figure 1 shows the schematic of an experimental set-up of possible MOC single tissue or multi-tissue cocultures. Primary tissue biopsies and in vitro-generated tissue equivalents from cell lines or primary cells can be cultivated either using 96-well cell culture inserts or by placing them directly into the tissue culture compartments. As the channel system interconnecting the cell culture compartments is only 100 µm high, tissue equivalents exceeding these dimensions will be kept within the culture compartments. The endothelialization of the MOC circuit with primary HDMECs enables a further step forward towards more physiological culture conditions by providing a biological vascular structure. Figure 1: Schematic representation of MOC cultures. Tissue equivalents are prepared under standard in vitro conditions, inoculated into the MOC and cultivated as single cultures or cocultures under dynamic conditions. Daily media samples and endpoint analyses are performed. Air pressure to drive the pump is applied through the three blue tubes connected to the MOC from above. Please click here to view a larger version of this figure. Following the endothelialization protocol, a confluent HDMEC coverage of the microfluidic channel circuit is obtained within four days of dynamic culture, as shown in Figure 2. Cells readily adhere to the walls of the MOC channel, create a confluent monolayer, and elongate along the shear stress (Figure 2B). Furthermore, cells cover the entire circumference of the channels, as reported previously 9. No further change in endothelial morphology was observed after four days of cultivation until the end of culture. Figure 2: Endothelialized MOC channels. Human dermal microvascular endothelial cells (HDMEC) formed a confluent monolayer in the microfluidic circuit. Cells were stained with acetylated LDL after 23 days of MOC culture. (A) The whole microvascular circuit was covered with cells and (B) cells elongated along the shear stress. Scale bars: (A) 1,000 µm and (B) 100 µm. In a further experiment, consistent disk-shaped liver cell spheroids are formed from HepaRG and HHSteC during two days of hanging drop culture, as this model system was previously reported as being suitable for drug metabolism studies 11–13. 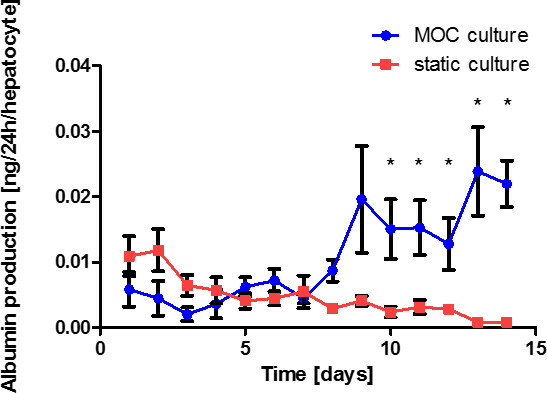 For demonstration purposes, one tissue culture compartment of each MOC circuit was seeded with 20 spheroids in 96-well cell culture inserts and tissues were cultivated over 14 days under dynamic conditions using non-endothelialized MOCs. Any number of aggregates or amount of primary material can be integrated either directly into the compartments or using cell culture inserts. Immunofluorescent staining of the spheroids after retrieval from the MOC shows a strong, homogenous expression for liver-typical cytokeratin 8/18 and phase I metabolizing enzymes cytochrome P450 3A4 and 7A1 (Figure 3A and 3B). Staining of canalicular transporter multi-drug resistance protein 2 (MRP-2) revealed a polarized phenotype and the existence of rudimentary bile canaliculi-like networks (Figure 3C). Figure 3:. Cultivation of human artificial liver micro-tissues in the MOC. Liver aggregates cultivated for 14 days in the MOC were stained for (A) cytokeratin 8/18 (red) and (B) cytochrome P450 3A4 (red) and 7A1 (green). (C) Expression of canalicular transporter MRP-2 (green), blue nuclear staining. Scale bars: 100 µm. As the production of albumin is one essential prerequisite of liver tissue cultures, it has been selected to monitor liver-typical activity in the MOC. Analyzing daily media samples for albumin production shows a significant increase in production rate in MOC cultures compared to static cultures (Figure 4) and to values reported in literature 11. The increase in the albumin synthesis rate might be attributed to the increased oxygen and nutrient supply in MOC cultures. Hence, the MOC is able to sustain liver aggregates over a culture period of 14 days in a metabolically active state, enhancing liver-typical behavior, such as albumin production. Figure 4: Fourteen-day liver spheroid performance in the MOC. Albumin production of liver single tissue cultures in the MOC and in static culture. Data are means ± SEM (n = 4). Subsystemic repeated dose toxicity testing of chemicals and cosmetics in animals requires 21 to 28 days of exposure, as defined by the OECD guideline no. 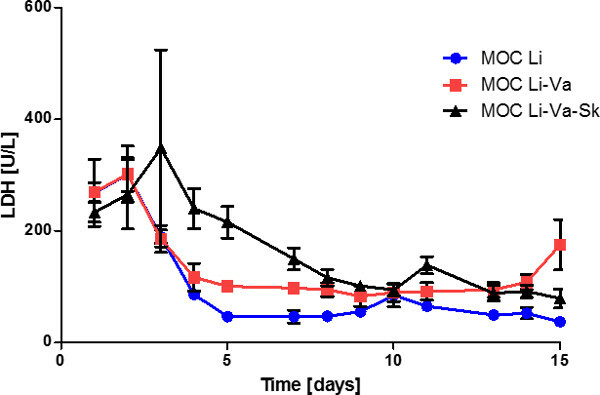 410 “Repeated Dose Dermal Toxicity: 21/28-day Study.” Long-term skin-liver cocultures are exemplified here for up to 28 days to cope with regulatory requirements. An air–liquid interface is provided for later dermal substance exposure by cultivating skin biopsies in 96-well cell culture inserts. The coculture experiment is performed exemplarily in endothelialized MOCs to prove whether a three-tissue coculture in a combined media circuit can be kept viable and metabolically active over 28 days. Analysis of the LDH activity in media supernatants revealed a steadily decreasing level during the first eight days of culture, which stayed constant at about 80 U/l thereafter (Figure 5). This indicates an artificial but stable tissue turnover in the system at later time points. Comparing the three-tissue coculture to liver single-tissue and liver-endothelial coculture experiments, a significantly decreased LDH level could be found, especially during the first days in cultures not including the skin. Cell death within this first period of high LDH activity occurred primarily in the skin culture compartment, as skin single tissue MOC cultures revealed (data not shown). This might be due to the wounded area surrounding the biopsy as a result of the punching of the skin. Figure 5: Fifteen-day tissue performance in the MOC. LDH activity in the media supernatants of liver single tissue cultures (MOC Li), liver cultures in endothelialized MOCs (MOC Li-Va) and liver-skin cocultures in endothelialized MOC (MOC Li-Va-Sk). Data are means ± SEM (n = 4). 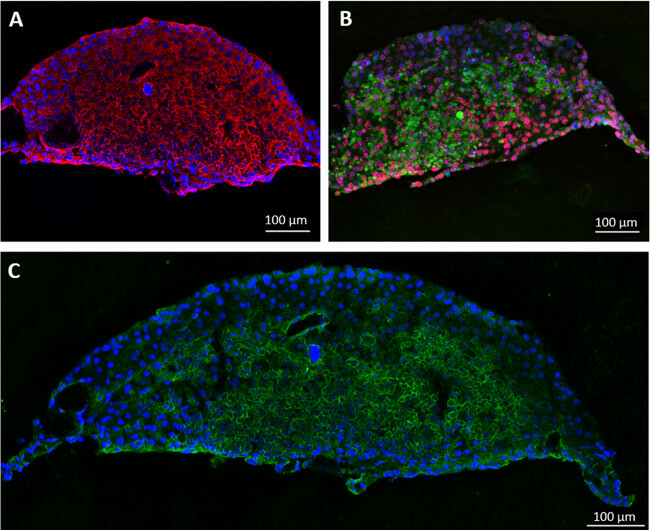 During the 28-day culture period, liver spheroids adhered to the bottom of the MOC and cells grew out, forming a multilayered connection between adjacent spheroids. This did not hamper tissue functionality. Endpoint analysis by immunofluorescence showed that liver spheroids were still metabolically active after 28 days of MOC coculture, as shown by cytochrome P450 3A4 staining (Figure 6A). HHSteC were distributed throughout the whole liver equivalent, as shown by vimentin staining (Figure 6B). An increase in vimentin staining intensity could be observed in areas where cells had grown out of spheroids. Staining for von Willebrand factor (vWF) showed that endothelial cells had not penetrated deeply into the tissue, but were in direct cell-cell contact with the outer hepatocytes (Figure 6C). Immunohistochemistry staining of the skin biopsies showed an expression of tenascin C and collagen IV in the basal membrane (Figure 6D), whilst staining of the static control showed elevated levels of tenascin C (Figure 6E). Tenascin C has been shown to be upregulated during wound healing, inflammatory processes and fibrosis, suggesting induced fibrotic processes in static, but not in dynamic cultures 14,15. Stable cell viability and functionality of tissues after a 28 day coculture in the MOC prove that the system is able to maintain a combination of up to three tissues in a common media circuit. Primary cells, as well as tissue models and biopsies, can be cultivated simultaneously in the MOC system. Figure 6: Performance of multi-tissue cultures over 28 days. Liver equivalents and skin biopsies were cultivated in an endothelialized MOC and cell functionality was shown by immunostaining of (A) Phase I enzymes cytochrome P450 3A4 (red), (B) vimentin (red), (C) cytokeratin 8/18 (red) and vWF (green) in liver tissue. Skin biopsies cocultivated for 28 days (D) in the MOC or (E) under static conditions were stained for tenascin c (red) and collagen IV (green), blue nuclear staining. (F) H&E staining of the skin after 28 days of MOC culture. Scale bars: 100 µm. The MOC platform described here represents a stable and powerful tool for cultivating tissues of various origins at dynamic medium flow conditions over prolonged culture periods 10,16. In this example, the platform was used to cultivate primary cells (HDMEC), tissue equivalents generated from a cell line (liver aggregates), and a coculture of the aforementioned with a tissue biopsy. The MOC was able to sustain the three-tissue coculture for up to 28 days in a combined medium circuit. To the best of the authors’ knowledge, this is the first time a multi-tissue coculture including biopsies, primary cells and cell lines has been performed over four weeks. One of the major drawbacks of microfluidic systems is the affinity of small molecules to adhere to the surface material of the fluidic circuit. As the surface to volume ratio is especially high in microfluidic systems, this effect becomes even more pronounced 17. The stable HDMEC coverage of the channels, introduced here, might act as a biological barrier preventing the adhesion of molecules to the MOC. Furthermore, it may serve as a hemocompatible vessel for whole blood circulation, preventing blood clotting. However, the use of whole blood as a medium substitution is not feasible as a full vascularization of the organ equivalents has not yet been achieved. Existing work on the vascularization of in vitro-generated tissues is promising and guides the way for further studies 18,19. It is well-known that hepatocytes tend to lose their liver-specific functions over time under static two-dimensional in vitro culture conditions 20. Metabolizing enzymes, such as the cytochrome P450 family, are of especial importance if the metabolism of a certain drug is to be studied. Cytochrome P450 3A4, an enzyme related to the biotransformation of many xenobiotics, and cytochrome P450 7A, which is involved in bile acid synthesis, were expressed in liver aggregates cultured in the MOC over 14 days. This indicates the preservation of a metabolically active phenotype, allowing for drug metabolism studies. The increased albumin production rate of aggregates in the MOC compared to static cultures is an additional indication for adequate culture conditions. The albumin production rates observed during this study were comparable or even higher than previously reported values obtained by microfluidic chips including HepG2 cells 21–23, however, values did not reach those of primary human hepatocyte cultures 24. Furthermore, the MOC system, in its temporary layout, does not allow for a separate segregation of bile. Cells in the aggregate polarized and formed bile canaliculi-like structures, as shown by MRP-2 staining. However, those canaliculi were not connected to a technical channel collecting the bile. This non-physiological mixing of the bile with the blood compartment has to be addressed in a future redesign of the system. The adjustment of flow characteristics is of high importance 25, especially with regard to tissues sensitive to shear stress, such as the liver. The amount of shear stress perceived by the tissue can be modified in two ways: Firstly, the air pressure used to push down the membranes of the pump can be lowered, decreasing peak shear stress values in the system. Secondly, the tissues can be embedded in an extracellular matrix layering or cultured in transwell culture inserts. The latter shield the tissues from the underlying current with a porous membrane. These adjustments need to be performed on an individual basis for each organ equivalent before starting the MOC experiment. At a pulsatile operation of 2.4 Hz, for example, which corresponds to a high, but still physiological, heart activity of 144 beats/min in humans, the shear stress measured in the channels of the microvascular circuit reaches approximately 25 dyn/cm2. This corresponds to a physiological shear stress at the higher end of the scale in microvasculature and is, therefore, well applicable for experiments including an endothelialization of the channels. However, as the current microfluidic layout of the MOC system presented consists of only one media circuit connecting the two organ compartments, one pumping velocity and shear stress rate has to be chosen for the whole system. Therefore, an exact adjustment of flow characteristics to the needs of each single organ is not always feasible. Furthermore, care has to be taken in adjusting the cells to the common medium. Cells are cultivated in the MOC in a combined media circuit, therefore, no individual cell culture media can be used for each tissue model, as is the standard for in vitro cell culture. A minimal combined media formulation needs to be defined beforehand and the cells need to be adjusted stepwise to this new media. An adjustment procedure of 80%/20% old to new media for two days, then 50%/50% followed by 20%/80%, and a full exchange always led to a reasonable cell viability and functionality of cultures in our hands. The current microfluidic layout of the MOC system allows the coculture of up to three tissues. A coculture of at least the ten most important organs of the human body is needed to reach homeostasis. Therefore, the system presented is able to predict specific tissue-tissue interactions, but not the true systemic response to a substance. A further development of the MOC to include more organ cavities is envisaged. Moreover, the validity of the system is to be shown using a set of reference compounds. Preferably, compounds that have failed during clinical trials (such as Troglitazone) are to be tested for their performance in the MOC. Whereas, a true validation of such complex systems is still impeded by the lack of standardization concerning biomarkers and endpoints for functional evaluation, collecting more data on the toxicological performance of this and similar systems will broaden their reliability and area of application. Uwe Marx is CEO of TissUse GmbH that produces and markets the Multi-Organ Chip platform used in the article. This publication was financed by an award granted by Corning Inc. The work has been funded by the German Federal Ministry for Education and Research, GO-Bio Grant No. 0315569. Kelm, J. M., Fussenegger, M. Microscale tissue engineering using gravity-enforced cell assembly. Trends in biotechnology. 22, (4), 195-202 (2004). Marx, U., Walles, H., et al. Human-on-a-chip Developments: A Translational Cutting-edge Alternative to Systemic Safety Assessment and Efficiency Evaluation of Substances in Laboratory Animals and Man. ATLA. 40, (5), 235-257 (2012). Baudoin, R., Griscom, L., Prot, J. M., Legallais, C., Leclerc, E. Behavior of HepG2/C3A cell cultures in a microfluidic bioreactor. Biochemical Engineering Journal. 53, (2), 172-181 (2011). Dash, A., Inman, W., et al. Liver tissue engineering in the evaluation of drug safety. Expert opinion on drug metabolism & toxicology. 5, (10), 1159-1174 (2009). Materne, E. -M., Tonevitsky, A. G., Marx, U. Chip-based liver equivalents for toxicity testing--organotypicalness versus cost-efficient high throughput. Lab on a chip. 13, (18), 3481-3495 (2013). Huh, D., Torisawa, Y., Hamilton, G. a, Kim, H. J., Ingber, D. E. Microengineered physiological biomimicry: organs-on-chips. Lab on a chip. 12, (12), 2156-2164 (2012). Sin, A., Chin, K. C., Jamil, M. F., Kostov, Y., Rao, G., Shuler, M. L. The design and fabrication of three-chamber microscale cell culture analog devices with integrated dissolved oxygen sensors. Biotechnology progress. 20, (1), 338-345 (2004). Tatosian, D. a, Shuler, M. L. A novel system for evaluation of drug mixtures for potential efficacy in treating multidrug resistant cancers. Biotechnology and bioengineering. 103, (1), 187-198 (2009). Schimek, K., Busek, M., et al. Integrating biological vasculature into a multi-organ-chip microsystem. Lab on a chip. 13, (18), 3588-3598 (2013). Wagner, I., Materne, E. -M., et al. A dynamic multi-organ-chip for long-term cultivation and substance testing proven by 3D human liver and skin tissue co-culture. Lab on a chip. 13, (18), 3538-3547 (2013). Vieira, U., et al. HepaRG human hepatic cell line utility as a surrogate for primary human hepatocytes in drug metabolism assessment in vitro. Journal of pharmacological and toxicological methods. 63, (1), 59-68 (2010). Abu-Absi, S. F., Hansen, L. K., Hu, W. -S. Three-dimensional co-culture of hepatocytes and stellate cells. Cytotechnology. 45, (3), 125-140 (2004). Leite, S. B., Wilk-Zasadna, I., et al. Three-dimensional HepaRG model as an attractive tool for toxicity testing. Toxicological sciences. 130, (1), 106-116 (2012). Chiquet-Ehrismann, R. Tenascins. The international journal of biochemistry & cell biology. 36, (6), 986-990 (2004). Sidgwick, G. P., Bayat, A. Extracellular matrix molecules implicated in hypertrophic and keloid scarring. Journal of the European Academy of Dermatology and Venereology JEADV. 26, (2), 141-152 (2012). Ataç, B., Wagner, I., et al. Skin and hair on-a-chip: in vitro skin models versus ex vivo tissue maintenance with dynamic perfusion. Lab on a chip. 13, (18), 3555-3561 (2013). Wu, M. -H., Huang, S., Lee, G. -B. Microfluidic cell culture systems for drug research. Lab on a chip. 10, (8), 939-956 (2010). Schanz, J., Pusch, J., Hansmann, J., Walles, H. Vascularised human tissue models A new approach for the refinement of biomedical research. Journal of Biotechnology. 148, (1), 56-63 (2010). Holnthoner, W., Hohenegger, K., et al. Adipose-derived stem cells induce vascular tube formation of outgrowth endothelial cells in a fibrin matrix. J Tissue Eng Regen Med. (2012). Dunn, J. C. Y., Yarmush, M. L., Koebe, H. G., Tompkins, R. G. Hepatocyte function and extracellular matrix geometry: long-term culture in a sandwich configuration. FASEB Journal. 3, 174-177 (1989). Leclerc, E., Sakai, Y., Fujii, T. Microfluidic PDMS (polydimethylsiloxane) bioreactor for large-scale culture of hepatocytes. Biotechnology progress. 20, (3), 750-755 (2004). Kim, M. S., Yeon, J. H., Park, J. -K. A microfluidic platform for 3-dimensional cell culture and cell-based assays. Biomedical microdevices. 9, (1), 25-34 (2007). Prot, J. -M., Aninat, C., et al. Improvement of HepG2/C3A Cell Functions in a Microfluidic Biochip. Biotechnology and bioengineering. 108, (7), 1704-1715 (2011). Riccalton-Banks, L., Liew, C., Bhandari, R., Fry, J., Shakesheff, K. Long-term culture of functional liver tissue: three-dimensional coculture of primary hepatocytes and stellate cells. Tissue engineering. 9, (3), 401-410 (2003). Powers, M. J., Domansky, K., et al. A Microfabricated Array Bioreactor for Perfused 3D Liver Culture. Biotechnology and Bioengineering. 78, (3), 257-269 (2002).